This morning, the Bureau of Economic Analysis (BEA) released new data for state-level personal income. In the second quarter of 2010, all 50 states (plus D.C.) showed positive income growth, ranging from 2.0 percent in North Dakota to 0.3 percent for Nevada. Arkansas personal income increased by 0.9 percent, just slightly lower than the national average of 1.0 percent. As shown in the chart below, personal income in both Arkansas and the U.S. peaked in the second quarter of 2007, with the data for Arkansas showing a shallower downturn during the recession than the U.S. The second quarter increase in Arkansas represented the fifth consecutive quarter of positive income growth. 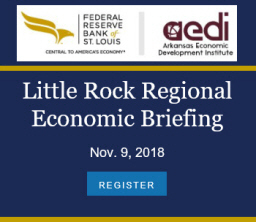 According to the press release from the BEA, Arkansas is one of 27 states where personal income has now climbed above the current-dollar level reached before the recession. In part, the relatively strong performance of Arkansas reflects newly-revised data. This morning’s announcement included revised statistics for the period 2001 through 2009. The chart below shows how the revisions affected data for Arkansas.